NNUH is a National Health Service (NHS) academic teaching hospital located on the southern outskirts of Norwich and was the first new NHS teaching hospital built in England for more than 30 years. It is one of the largest hospitals in the United Kingdom in terms of in-patient capacity and is a teaching centre for nurses (adult and children), midwives, doctors, therapists and operating department practitioners, whilst hosting the Norwich GP speciality training scheme. An efficient and convenient CCTV system is a key element in any effort to ensure the safety of hospital patients, visitors and staff. So when NNUH’s video monitoring system was hitting its technological limits, the hospital decided it was time for an upgrade of the control room. There was one major challenge: the control room is the main hub of hospital communications and therefore essential for 24/7 response to emergencies. As a result, NNUH required a seamless technology transition. For the upgrade of the control room, NNUH called in Check Your Security, a Norfolk-based integrator of security monitoring systems. Check Your Security first evaluated the current physical security system in place at NNUH in order to determine which products and solutions would be optimal for the future proofing towards a fully digital environment. This process was undertaken by using an Enterprise Audit Report (EAR) in which Check Your Security establishes a facility characterisation with the key stakeholders and investigates how the latest advances in technology can be implemented. Based on the EAR, Check Your Security proposed to equip Norfolk and Norwich University Hospital with a new control room with the latest fully integrated and ergonomic command centre furniture. This shared working environment was tailored to NNUH’s needs and now incorporates an effective incident planning area, making use of the latest Latitude VMS version from FLIR for real-time situational awareness. The control room now also features a video wall integrating the video feeds of key cameras, together with a connection to the barriers, access control and emergency intercoms. FLIR’s Latitude VMS provides seamless, forensic quality imaging and user-friendly operation consisting of dedicated, web-based and mobile client software. The system’s scalable architecture efficiently supports systems of any size or architecture for implementation throughout enterprises, across multiple sites, cities and continents. Latitude version 7.0 offers effortless viewing, playback, search and export, while maintaining scalability and usability. As part of the transition to a digital platform, the analogue recording equipment has been decommissioned and the existing cameras have been migrated onto FLIR recording servers and analogue video encoders to integrate its existing 76 external PTZ cameras, internal static cameras, intercom help points and barriers. FLIR’s range of encoders and edge devices allow for a seamless technology transition from analogue to digital using existing site infrastructures. FLIR’s Arisel encoder products transform analogue video signals into digital video streams and transmit them via LAN, Internet or Intranet for live viewing and recording. Ariel encoders support H.264 and bi-directional audio. The NNUH security network and control room environment was quite challenging, with a range of outdated technology and legacy hardware across the hospital. But the implementation of FLIR’s Latitude VMS was in fact a smooth and cost-effective transition, allowing Check Your Security to easily integrate the new solution from FLIR into the NNUH existing infrastructure. The upgraded control room with FLIR’s VMS has resulted in an extremely user-friendly and ergonomic shared workspace and lowered operational costs, enabling better patient control and higher quality service. The total solution not only consumes less space, but has also resulted in lower power consumption. But the most important benefit for NNUH’s control room operators probably is that the internal investigation time has been reduced by 25%. 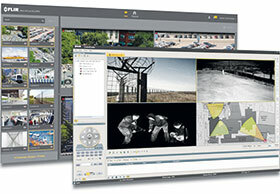 FLIR’s Latitude VMS has certainly contributed to this, with its sleek and modern client web interface, optimised use of touch screens, thumbnail search for quick and accurate identification of desired clips and its presentation of relevant data and actionable information, allowing control room operators to focus on what is important. For more information contact FLIR Systems www.flir.com or refer to the www.hsbd.co.za for SA distributors.